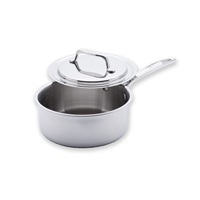 The USA PAN 7 Inch Sauce Pan with Cover is perfect for cooking small veggies like corn, peas, and broccoli. With 5 layers of aluminum core and a stainless-steel exterior, this saucepan with lid distributes heat smoothly and evenly to prepare flavorful stocks, chowders, bisques and pasta sauces. A lifelong addition to your kitchen, the 5-ply stainless steel USA PAN 8-Inch Sauce Pan with Cover allows home chefs the ability to maintain consistent cooking temperatures. 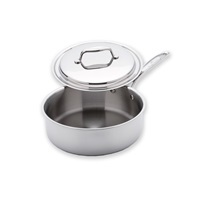 The USA PAN 8-Inch Sauce Pan with Cover distributes heat smoothly and evenly to allow home chefs to prepare flavorful stocks, chowders, bisques, and pasta sauces.